Kersten Hamilton on Kersten Hamilton: "I was born in a trailer in High Rolls, New Mexico, in 1958. My parents, who were not very practical people, neglected to go to the hospital or inform anyone of my arrival, so some Official Document Confusion existed for a long time as to the exact year and date. "By my sixth birthday, I knew what I wanted to be when I grew up. I wanted to be a writer. I was fascinated by the sound of words, the sweep of story. I wanted to make word-magic and tuck it inside the covers of a book. "A writer, of course, needs something to write about. Fortunately, my impractical parents were also quite eccentric. My childhood can only be described as 'exciting.'" "I tracked caribou and arctic wolves across my family's homestead in Alaska, caught tiny tree frogs in the swamps and rain forests of the Pacific Northwest, and chased dust devils and rattlesnakes across the high desert of New Mexico. "Against all odds, I survived. I was not electrocuted or drowned. Most of the bullets missed, and the incidents with bears, snakes, wolves, and angry moose were not fatal. "Before settling down to have children I worked as a ranch hand, a wood cutter, a lumberjack, a census taker, a wrangler for wilderness guides, and an archaeological surveyor. "Now that my children are all grown and off on their own adventures, I write full time." Would you tell us about your apprenticeship as a writer? How did you develop your skills? For me there are two equal--and equally difficult--parts to being a writer. The first is having something real to say. Being a writer is about telling the truth, even when it is ugly or scary. That takes courage. If I am not up to that challenge, I might as well put my laptop down and walk away. The second is having the skill to say it in such away that readers sit up and take notice. This is hard work. I tell people that becoming a writer will take as much time and commitment as becoming a doctor. At least eight years of education. The difference is, most writers create their own coursework. They write everyday. They study the masters, new and old, every day. The learning never stops. Right now the masters I am studying include Flannery O'Connor, Neil Gaiman, and Eiichiro Oda, creator of my current favorite manga, One Piece. How was your path to publication, any sprints or stumbles along the way? "Sprints and stumbles" would about cover it! A stumble: Early in my career being so hurt by a revisions request that I never sent the book back. 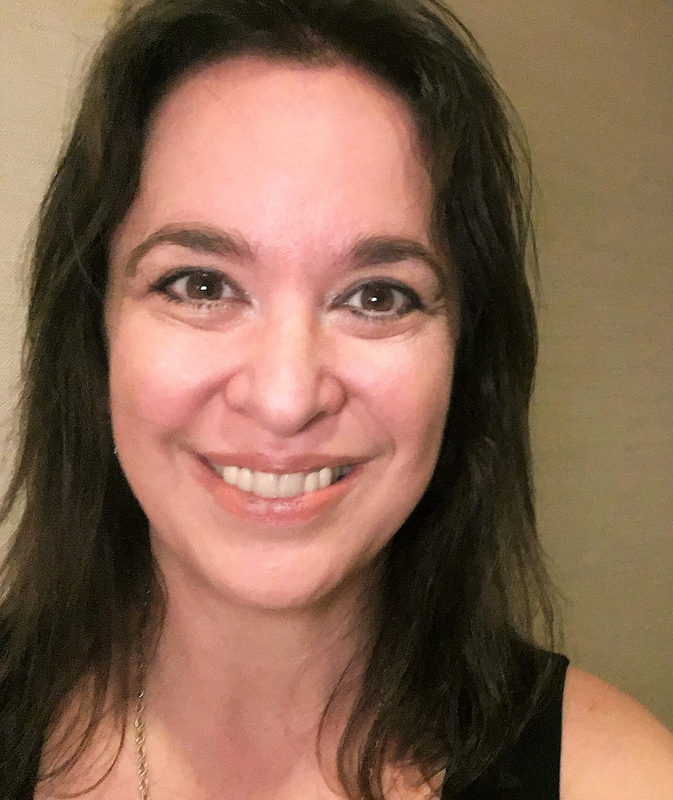 A stumble: Tripped over my ego and fell flat on my face when I expected the publishing world to change to accommodate my stories, no matter how long my picture books or how short my novels. It does not matter how wonderful your work is, if it will not fit the format, it will not be published. A sprint: Finally understanding that books have a physical body and physical limitations--and consequently selling two picture books in one day! The book sold through its first print run quickly, and was picked up by Dolly Parton's Imagination Library. There are now about 200,000 copies in print. Would you update us on your back-list titles, highlighting as you see fit? I can tell you about some of my books, and why I wrote them. Rockabye Rabbit, illustrated by Saundra Winokur (Cool Kids Press, 1995) was the story of a homeless boy. I wrote it because I experienced homelessness both as a small child and as a teenager. It was a subject that was near to my heart. Unfortunately, Cool Kid's Press went out of business only two months after the book was printed. Now it is a homeless book, with lost and lonely copies wandering the world. The Butterfly Book: A Kids Guide to Attracting, Raising, and Keeping Butterflies (John Muir Publications, 1997). When I was ten years old, I killed a butterfly. I didn't mean to kill it—in fact, I was trying to save it. I had collected a chrysalis before it could be destroyed along with a pile of weeds. I knew it was alive because it twitched when I touched it. When the chrysalis grew stiff and stopped twitching, I thought it was dead. I cracked it open to see what had happened to it. The chrysalis was full of soupy green-brown goo. I thought the caterpillar had rotted. When I researched it, I found out that inside the mummy–like chrysalis--a caterpillar's flesh and organs dissolve. It turns into a living soup! The few cells that remain together carry the blueprint for an adult butterfly. The caterpillar soup reforms around these groups of cells into the wings, legs and body of an adult. I went on to raise many healthy butterflies, and thirty years later, I wrote The Butterfly Book in memory of the butterfly I killed. It is used in classrooms across the nation. I hope it saves tens of thousands of butterfly lives. This is the Ocean, illustrated by Lorianne Siomades (Boyds Mills Press, 2001) describes the water cycle in lyric poetry. Science, music, and poetry have beauty, order, and structure in common. I was mixing them in unit studies as I homeschooled my children the year I wrote This is the Ocean. Lorianne Siomades' torn paper art was not at all how I pictured the subject. But I adore it, especially the purple mountain goats! This is the Ocean has recently experienced a jump in sales. I expect this is a side effect of the concern about global warming. 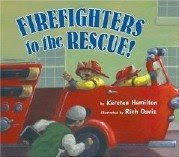 Firefighters to the Rescue!, illustrated by Rich Davis (Viking, 2005.) I wrote my "rule-breaking book" because I saw a curly-headed little boy in a preschool parking lot beside a shiny new fire truck. He was bouncing in place, as excited on the outside as I was on the inside! I wanted to share that excitement with lots and lots and lots of little boys…and that is just what has happened! Rich Davis did a wonderful, complex job on the retro illustrations. I like to challenge readers to find Rich's sly nod to his favorite movie, "It's a Wonderful Life." 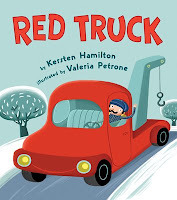 Congratulations on the release of Red Truck, illustrated by Valeria Petrone (Viking, 2008)! Could you tell us a little about the book? Thank you! I love this book. It is the "youngest" picture book I have written. It is for three–year–old boys who love trucks and adventure. This is such a short text—just 106 words—that very small things are important. Not just words—the sound of individual letters and letter combinations. The whole book was it was "sparked" by the sounds inside the title words: "red truck." I love the repetition of the R's; the almost hard D and the hard CK sounds. I like the way it feels to say them, I like the way they settled in my ears. They were fun, fun sounds and grew into a fun, fun book! Red Truck might not be the best example of my creative process. Sometimes a book hits like lightning, and a story is burned in your mind. Red Truck was a lightning book. It was fast, and came out just right the first time. I think it took a whole week to sell. That sounds nice, but recovering from a lighting strike is not easy. If there is one guarantee in the writing universe, it is this: after a lightning strike, the next book will not be easy. My next picture book was hard fought, one painful word at a time, revision after revision. It took me weeks to get the first draft down, revision after revision to get the final draft right. What did Valeria Petrone's illustrations bring to your text? Atmosphere and drama through the color palette that she chose, a sense of place and character through the depiction of the fantastically fun truck driver, a child-like friendliness in the subtle expressions on the truck. That was needed to offset the gritty text. I love every bit of what Valeria did. I think she was the perfect illustrator for this book. You write for both the mainstream and Christian markets. How do they differ? Good question. There is very good writing and very bad writing in both markets, of course. I think the greatest difference would be in marketing and promotion strategies. Library-and-school sales and school visits are the bread and butter of mainstream children's writers. In many places, public schools and libraries will not purchase books published by Christian book houses or consider authors published in the Christian market for school visits. I find it ironic that two kinds of books get banned from school libraries: books with graphic language and/or sexual content and Christian books. Christian writers do have some opportunities that are not open to authors of mainstream books. There are hundreds of Christian radio programs that are happy to do author interviews. This is an excellent way to reach homeschooling parents, who buy a lot of books. You have written eight books in the Millie Keith series (A Life of Faith/Mission Press, Zonderkidz, 2001-)(scroll to view). How did the series come to be? In 1999, Mission City Press gave me a marvelous opportunity—they asked me to write a series of novels based on characters created by Martha Finley, a Christian writer of the late 1800's. I was delighted by the challenge, but a little worried that ladies of the Victorian age would be boring. I turned to diaries and historical documents to find out. It turns out they weren't all prim and proper, sitting in parlors sipping tea. Some wrote books. Some challenged injustice. Some traveled the world alone. 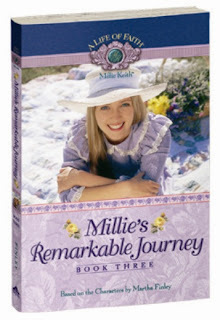 Three of the women I read about became the real–life models for the new adventures of Millie Keith. Sarah and Angelina Grimke, daughters of a Southern judge and plantation owner, laid down their wealthy lifestyle, their social standing, and the respect of "proper" society to fight slavery. Victorian ladies were not supposed to notice "indelicate" things such as the way slaves were treated. When Sarah and Angelina not only noticed but stood up and spoke against slavery, their lives were threatened. They were warned not return to the South. They were thrown out of two Christian denominations for being so bold! The Grimkes became suffragettes as well as abolitionists, fighting for the rights of women to have an education, to speak about social injustice, and to vote. Thousands of women attended their lectures; tens of thousands read their pamphlets and articles. Isabella Bird's travels began in the 1840's, when she was hardly more than a teenager. Her father, an English pastor, sent his brilliant daughter to the Americas to report on the state of Christianity there. Isabella, a young lady of culture and refinement, traveled alone and loved it. She eventually became a world traveler, who wrote wonderful books. Have you written any other books for the press? If so, could you tell us about them? Yes. 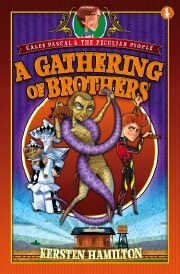 I wrote a young slave girl, Laylie Colbert, into the Millie Keith books. The editors liked Laylie so much they asked me to write a book about her. That book became Laylie's Daring Quest. Laylie lived well before the Civil War, during the harshest of the slavery years. To capture the attitudes of the day, I read pro–slavery sermons and apologetics, anti–slavery sermons and Abolitionist papers, diaries and memoirs of plantation owners and southern whites, and hundred of slave narratives. I have never cried so hard researching or writing a book. I hope it opens minds and changes hearts. Writing it changed my life. You've also published four books in the Caleb Pascal & the Peculiar People Series (Standard, 2007-). Could you tell us how the series came to be? The story of the Caleb series is a good counterpoint to the lightning-like creation and sale of Red Truck. It was both slow and difficult. In writing Laylie's Daring Quest, I presented other people's pain. In writing Caleb, I exposed my own. Thomas Wolfe said, "The deepest search in life, it seemed to me, the thing that in one way or another was central to all living, was man’s search for a father, not merely the father of his flesh, not merely the lost father of his youth, but the image of a strength and wisdom external to his need and superior to his hunger, to which the belief and power of his own life could be united." Wolfe touched on a literary archetype than runs through all cultures, and all times: The orphan, searching for what he has lost. It will be told a million times in a million voices, from Moses to Oliver Twist to Luke Skywalker to Harry Potter, and loved every time it is told well. Caleb, Son of None is the story of my orphan heart. The original story took months to work itself out of me, like a thorn coming out slowly from deep in my flesh. And when it was out, and when it was right…it didn't sell. For ten years, it didn't sell. Sometimes the market isn't quite ready for a book. And then, something changes. When Standard signed for Caleb Son of None, they wanted three more books about Caleb. And they wanted all three in twelve months. Fortunately, the tight schedule of the Millie books and the painful honesty of the Laylie story had been a good school for me. What advice do you have for picture book writers? Get out your boots and Indiana Jones whip. It's time to blaze a path through no man's land, between oral tradition and the written word. Your readers are sophisticated thinkers and storytellers who lack only reading skills. Learning to track those letters across the page is one of the most difficult things they will ever do. Use every tool and skill you have to make sure it is a thrilling journey and that the payoff at the end makes the hard work worthwhile. Dip into child psychology and emergent-reader studies. If your latest contact with that world was Piaget, who believed that a preschool child could not follow a narrative, or "Sesame Street," which was intentionally anti–narrative, you need to do some reading. A three–year–old may not be able to follow complicated plot twist or subplots, but narrative is essential to them. They order, structure, and understand their world through narrative. They make sense of their daily lives through story. For those who write YA and adult novels—thank a picture book writer today. If they had not broken that path through the wilderness long ago, no one would be reading your novels. Flowers and chocolates are appropriate gifts for picture book writers. Tossing rose petals in front of them while they walk is acceptable. Large checks are always appreciated. Sometimes, when I finish a picture book, I put on my YA novelist hat and send my picture-book self a box of truffles. Those writing for the Christian market? First: avoid religiosity at all costs, and don't make excuses for it. Jesus had very little to do with religiosity, and certainly not the distorted version certain segments of the church display today. Second: tell the truth. Faith is messy and scary and sometimes confusing. Every Christian is flawed. Write them that way. People of other faiths—Muslim, Hindu, Wiccan, Buddhist, Pagan, Native people who embrace their traditional religions, etc.—can be deeply moral, caring, honorable people. If, in your books, they are morally or intellectually inferior to the Christians, you have portrayed them as less than human. Dig deeper. Being a follower of Jesus is not about being better than other people. A Bible scholar asked Jesus, "How do I get eternal life?" "What does the Bible say?" Jesus asked. "Love God with all your passion, strength and mind," the man replied. "And to love your neighbor as much as you love yourself." That answer was not quite good enough for the Bible scholar. The town was full of dirty people, people who didn't deserve to be loved. "But who is my 'neighbor'?" he asked. "Let me tell you a story," Jesus said. "A certain man was traveling through town when two thugs grabbed him. They beat him up, stole his wallet, and left him bleeding and senseless, face down in the filthy gutter. "The youth director of a local church was in the neighborhood leading his high school group in a community project. When he saw the man in the gutter, he moved his students to the other side of the street. He would never hear the last of it if he let them get involved in that kind of mess. "A mega–church minister was driving down the street on his way to a pastor's gathering. He slowed as he passed them man, and then went on. At the meeting, he told everyone about what he had seen. They prayed for God to abolish street violence, and voted to create a charitable fund for victims. "The one who was kind," the Bible scholar said. "Yes," Jesus said. "Go and do the same." With just one story, Jesus turned the man's world upside-down. You see, the question was not: "How do I be a neighbor?" The question was: "Who is my neighbor? Who must I love?" And the answer was, "the most despised person in your community." The "go and do the same" was just icing on the cake; a very uncomfortable message in 32 CE or 2008. That's the kind of depth and revelation we should aim for in our fiction. Fourth, and finally, my own motto: Don't let the plot drag. That doesn't honor God. Those writing a series of novels? Series are intense, engrossing, consuming. It is easy to lose track of them or to get lost in them. Keep a series "bible," and update it frequently. Keep track of the small details. Eye color, middle names that are only mentioned once, random uncles. Keep track of your character's favorite foods and racy birthmarks, and the spelling of their names. Also keep a family "bible," and I don't mean a Good Book. A notebook will do. In the family "bible," write down the names and brief descriptions of your children and your spouse. That way, when someone interrupts you, you can glance at it and figure out who they are. Why are stories of faith for young readers important to you? "Modern stories have made sweeping efforts to hide or show embarrassment regarding our religious identity…I refuse to bow to their pressure for the same reason I don't remove the F–word from my dialog…because my job is to tell the truth. Mobsters, strippers, gang–bangers and priests have deep theological thoughts about their religious experience and so do my characters." Yes. That's it exactly. My job is to tell the truth. You are certainly publishing with much success! How do you structure your writing time? Structure? What's that? And, um…what year is it? How do you balance the craft of writing against the responsibilities of being a published author (correspondence, events, media, other promotion)? I am a fairly good writer, very happy sitting in my own little space—any closet or cranny will do—writing, writing, writing. I love my stories! I am a terrible author. If I could pay someone to make author's appearances for me, I would. Unfortunately, Lemony Snicket thought of it first. And, I foolishly put my real name on my books right from the start, which ruined any hope of future anonymity. If you could go back and talk to yourself when you were beginning author, what advice would you offer? It's a good thing you love writing, kid. You are going to get to write to your heart out! Publishing, now, that's a different story. Your career is going to take longer, be harder, and have more twists and turns than you can even imagine. Don't give up. I have a new picture book coming from Viking next year that I am very excited about! Police Patrol is a cop shop story, nitty-gritty for the itty-bitty. R. W. Alley, the illustrator, has done a brilliant job. He's added a whole new layer to the story. 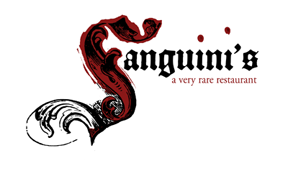 My current WIP is a mainstream urban fantasy loosely based on the Finnian Cycle. I am loving this book, the characters and the story. I can't wait to share it with the world! Great interview, Kersten and Cyn! Wow, what an interesting life you have led. Hurrah for the Goblin Wars series! Thanks, R.A.! Kersten is a gem! Sent you a note of late. Ping me directly if you didn't receive it.